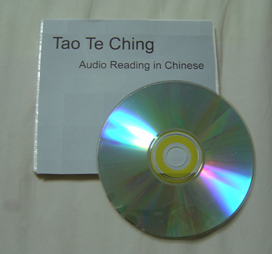 and Tao Te Ching Audio CD Reading in Chinese. 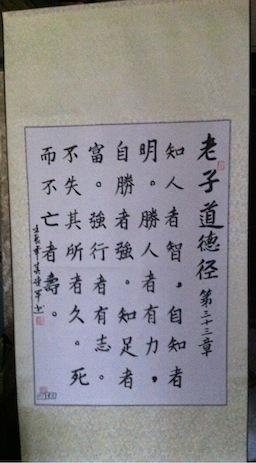 The Tao Te Ching (Daodejing) spoken in original Chinese language. The Tao Te Ching has been translated many times into different languages, but you can now obtain the audio CD book reading of the original Chinese language version by a native speaker from China. Hear how the individual words are supposed to be pronounced in "Putonghua" or "Mandarin" as they were originally spoken in ancient China. You will get a CD containing all 81 individual chapters of the Tao Te Ching read in Chinese. Hear the CD along with original PinYin and Chinese character versions of the Tao Te Ching, and you soon you will be able to recognize Chinese in no time. If not, at least know how they sound. There are two versions. For most people, order the classic mandarin version. If you are interested in hearing how accented Chinese sound like (Southern China KeJia dialect accent), order the second version. Here are the immortal people who have limited serialized calligraphy of the first chapter of the Tao Te Ching (Dao De Jing) in Seal Script Style (Zhuan Shu), by a master painter in China. East Gate Health Associates, Inc. 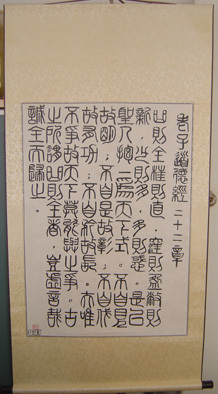 The scrolls you see on this page were painted (calligraphy) by a master painter in China. Each one is serialized with a number and actually shipped from China via SAL (Surface Air Lifted) which takes approximately 4-5 weeks to deliver. The painted portion of each scroll is about 2 feet wide and 3 feet tall. The height increases 2 feet when the scroll portion is included. Feel free to purchase one directly by clicking on the "Buy Now" button. 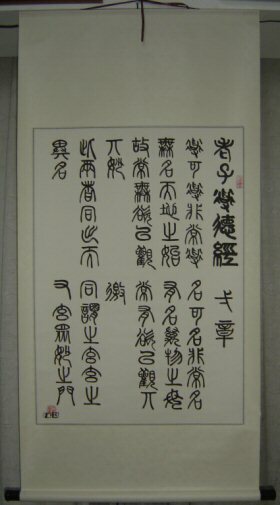 Here are the immortal people who have limited serialized calligraphy of the first chapter of the Tao Te Ching (Dao De Jing) in Regular Script Style (Kai Shu), by a master painter in China. 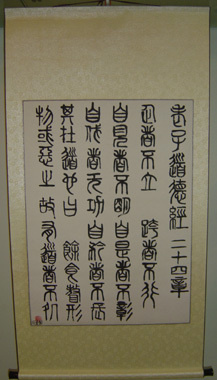 Seal Script Style (Zhuan Shu) 8th Chapter of Tao Te Ching (Dao De Jing). Here are the immortal people who have limited serialized calligraphy of the 8th chapter of the Tao Te Ching (Dao De Jing) in Seal Script Style (Zhuan Shu), by a master painter in China. 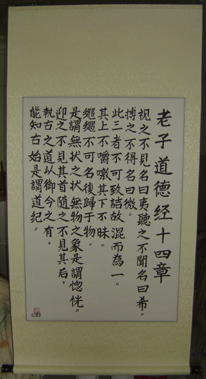 Regular Script Style (Kai Shu) 12th Chapter of Tao Te Ching (Dao De Jing). 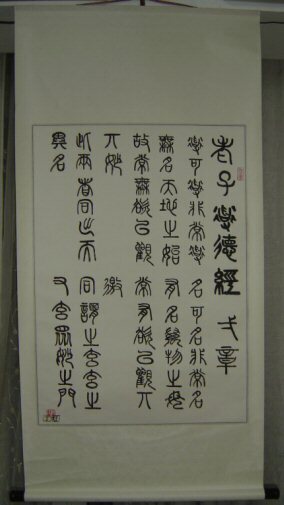 Here are the immortal people who have limited serialized calligraphy of the 12th chapter of the Tao Te Ching (Dao De Jing) in Regular Script Style (Kai Shu), by a master painter in China. 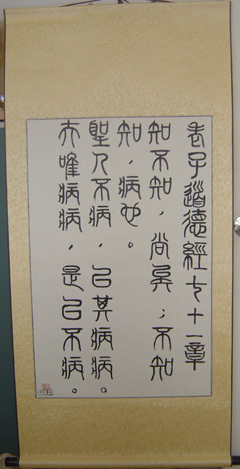 Regular Script Style (Kai Shu) 14th Chapter of Tao Te Ching (Dao De Jing). Here are the immortal people who have limited serialized calligraphy of the 14th chapter of the Tao Te Ching (Dao De Jing) in Regular Script Style (Kai Shu), by a master painter in China. 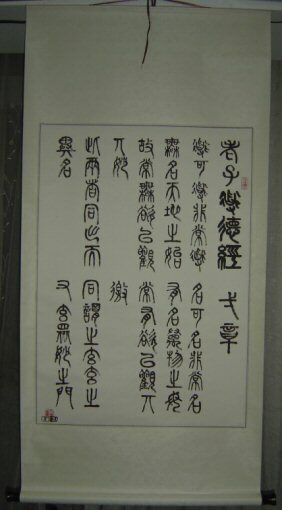 Seal Script Style (Zhuan Shu) 15th Chapter of Tao Te Ching (Dao De Jing). Here are the immortal people who have limited serialized calligraphy of the 15th chapter of the Tao Te Ching (Dao De Jing) in Seal Script Style (Zhuan Shu), by a master painter in China. 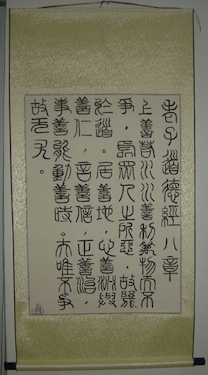 Seal Script Style (Zhuan Shu) 22nd Chapter of Tao Te Ching (Dao De Jing). Here are the immortal people who have limited serialized calligraphy of the 22nd chapter of the Tao Te Ching (Dao De Jing) in Seal Script Style (Zhuan Shu), by a master painter in China. 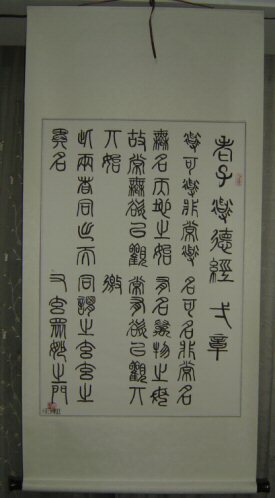 Seal Script Style (Zhuan Shu) 24th Chapter of Tao Te Ching (Dao De Jing). Here are the immortal people who have limited serialized calligraphy of the 24th chapter of the Tao Te Ching (Dao De Jing) in Seal Script Style (Zhuan Shu), by a master painter in China. 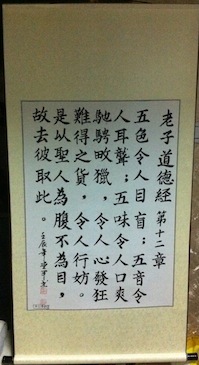 Regular Script Style (Kai Shu) 33rd Chapter of Tao Te Ching (Dao De Jing). Here are the immortal people who have limited serialized calligraphy of the 33rd chapter of the Tao Te Ching (Dao De Jing) in Regular Script Style (Kai Shu), by a master painter in China. Direct order next available serial number: SOLD OUT! 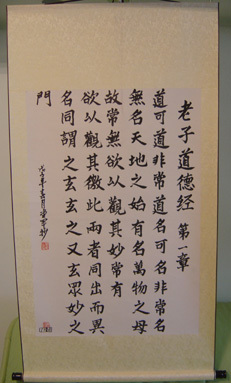 Regular Script Style (Kai Shu) 38th Chapter of Tao Te Ching (Dao De Jing). Here are the immortal people who have limited serialized calligraphy of the 38th chapter of the Tao Te Ching (Dao De Jing) in Regular Script Style (Kai Shu), by a master painter in China. 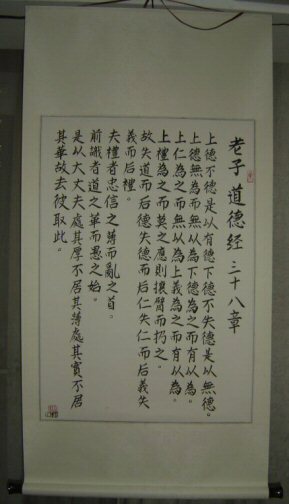 Seal Script Style (Zhuan Shu) 71st Chapter of Tao Te Ching (Dao De Jing). Here are the immortal people who have limited serialized calligraphy of the 71st chapter of the Tao Te Ching (Dao De Jing) in Seal Script Style (Zhuan Shu), by a master painter in China. 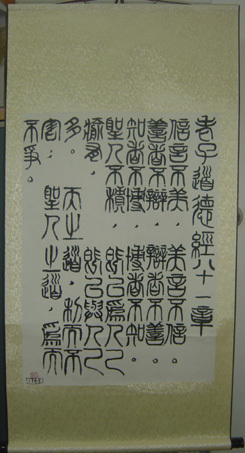 Seal Script Style (Zhuan Shu) 81st Chapter of Tao Te Ching (Dao De Jing). Here are the immortal people who have limited serialized calligraphy of the 81st chapter of the Tao Te Ching (Dao De Jing) in Seal Script Style (Zhuan Shu), by a master painter in China. Want a specific chapter of the Tao Te Ching? 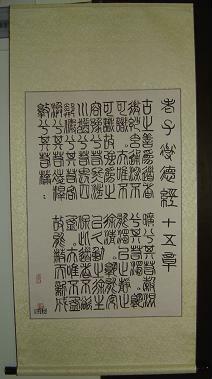 Custom order a scroll of your favorite chapter of the Tao Te Ching. It is possible to pick a chapter of the Tao Te Ching in the scrolls you see above. Simply click on the BuyNow button and in the comments or notes section of your PayPal payment, mention which chapter you wish to substitute in. There are two main calligraphy styles you can choose. If you wish for ZhuanShu style (the style the original Tao Te Ching was written in) simply purchase chapter 1 and put a comment to substitute a different chapter. If you wish for the KaiShu style (modern newspaper print style) purchase chapter 38 and again place a note in the payment stating for a different chapter.